For the 26th consecutive year, the world on November 1st, 2017 massively and resoundingly repudiated the U.S. economic war against the people of Cuba. 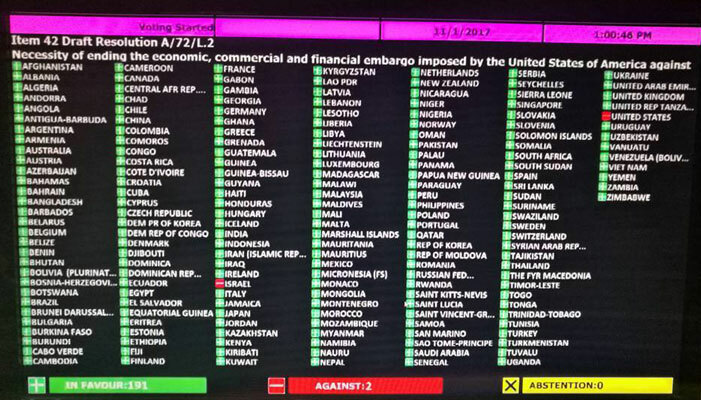 By a vote of 191 to 2, the member countries of the United Nations overwhelmingly condemned the U.S. economic blockade of that heroic island nation by voting in favour of the resolution, "Necessity of Ending the Economic, Commercial and Financial Embargo imposed by the United States of America against Cuba." Only 2 voted against the resolution: the United States and Israel. On November 1st international protest actions will he held to coincide with the annual United Nations vote against the U.S. economic blockade of Cuba. We encourage member groups of the Canadian Network On Cuba to participate in this day of international protest by organizing actions in their various communities. At present, protests are being organized in Halifax, Montreal, Quebec City, Toronto and Vancouver. Statement by the Ministry of Foreign Affairs of the Republic of Cuba in response to recent measures taken by the Trump administration following incidents involving U.S. diplomatic personnel in Havana. On September 29, 2017, the US Secretary of State Rex Tillerson announced the decision to significantly downscale the diplomatic staff of the US embassy in Havana and withdraw all their relatives, claiming that there had been “attacks” perpetrated against US Government officials in Cuba which have harmed their health. Consider this. The United States government doesn’t know who’s responsible for the so-called acoustic attacks on its embassy personnel in Havana. Then consider this. Cuban president Raúl Castro didn’t simply claim his government had nothing to do with the incidents, he did the unthinkable and invited the FBI to investigate. FBI agents haven’t been able to figure it out. Neither have American acoustics specialists or medical experts. Even Canada’s Mounties, whose own diplomats reported similar attacks, are stymied. Cuba holds an admirable place in the international community regarding the protection and promotion of the rights of its citizens. In Cuba everyone is guaranteed an education and access to universal and free healthcare. In Cuba no one is “disappeared” or the victim of extra-judicial execution. In Cuba there are no homeless roaming the streets, no one left to fend for themself, eking out an existence in a dog-eat-dog society. Cuba is not a haven for the economic violence that reigns in so many countries. This submission will briefly summarize Cuba’s domestic achievements, as well, as the island’s considerable contribution to the well-being of the world’s nations and peoples. Our campaign is off to a good start thanks to a spirit in which suggestions and initiatives are being taken in an organized way that keeps reminding us of one of Fidel's frequently repeated dictums: "cada soldado un comandante" (every soldier a commander). This spirit was abundantly evident in a very successful event held last Friday, September 22, in Toronto by the end of which, combined with other events, and including donations received from other parts of the country, we can say that we have so far collected $35,000.